Do you want to protect all of your computer activity like browsing, Skype, email and p2p from prying eyes? You may, or you may not know all or at all about the VPN, but every one of us has heard about it. Let me give you a brief description of it; VPN stands for a Virtual Private Network, what it does is that it extends a private network across a public network or we can say that it allows the user to connect to a private network over the Internet securely and privately. VPN does so by setting up an encrypted connection known as the VPN tunnel, and all the network traffic passes through this secure tunnel. Now you must be wondering, why do we need this VPN? Let’s look at the way your devices connect to the internet, whenever you log in to the web your device connect to your Internet Service Provider (ISP) and it then connects you to any internet resource as per your request. A resource can be anything like a website, cloud or any other thing. So as per security point of view, there’s an issue here, as you connect to the internet resources via your ISP, so it knows about all your internet activities. And along with that, all the authorities can gain information about whatever you do on the web. Many applications and websites are blocked in certain geo they may be blocked for any reason, using VPN even those can be accessed. If you need to send some sensitive information from your computer that instead of connecting to a private network is connected to a public network; VPN comes in handy here. It provides you with the security of a private network even if you are attached to a public network. As discussed earlier, government and other agencies can track your online activities with the help of your ISPs; VPN creates a virtual tunnel between you and the web resource and hence you have added privacy, and you can maintain your anonymity. Many businesses have their information stored in an online server these days, so it’s imperative for companies to secure each and every connection that their employees make to the server; VPN comes in handy here and provides a secure connection to remote server. Myths in the market say that VPN and cost reduction can’t go along, but it isn’t true; once the VPN is setup its maintenance cost is significantly reduced and hence it helps in cost reduction for many personnel, businesses or enterprises. There are many VPNs in the market, so here’s one that’s a complete package: WINDSCRIBE VPN. Why Should One go with Windscribe? Windscribe comes in two forms, one in for the desktop and another is for the browser. It’s a full VPN client, so it protects all of your computer activity like browsing, Skype, email and p2p from prying eyes. Comes with features of firewall and thus prevents exposure of your home IP address in case of connection loss to Windscribe. With the browser, Windscribe integrates the form of extension. Blocks ads, beacons, and trackers that can compromise your privacy online. Secures link by generating and managing secure links right from your browser. Web contents are blocked in many countries around the world, but it shouldn’t be the case; the internet communities have demanded that the web should be a free space to share resources. Windscribe allows you to access those contents. Along with these features, Windscribe provides you with all the features concerning a VPN. As shown above, the download page provides you with the list of platforms on which it’s available. And on the top of the page detects your platform automatically and gives you the download link directly. In my case, it was Windows 10. 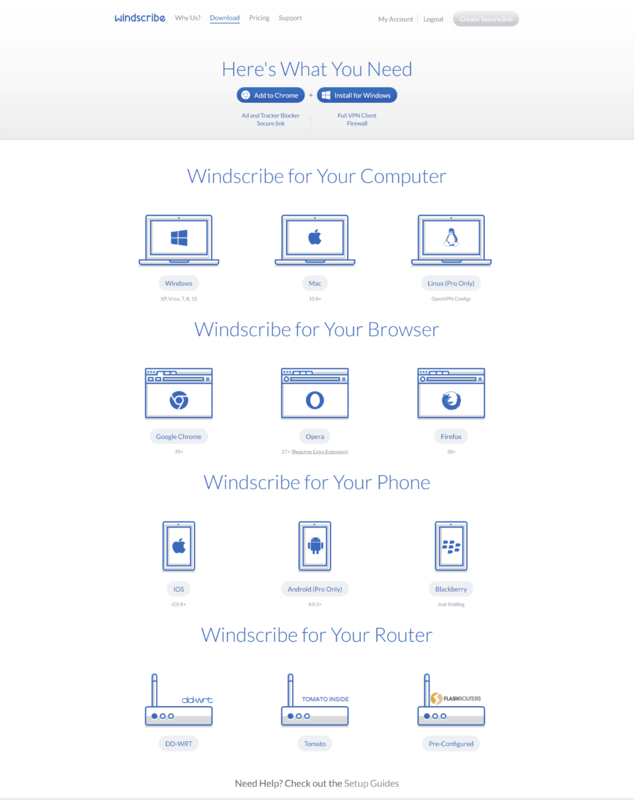 Installing Windscribe is a piece of cake. It’s a traditional windows application installation wizard. But you have to create a Windscribe account before availing its services. 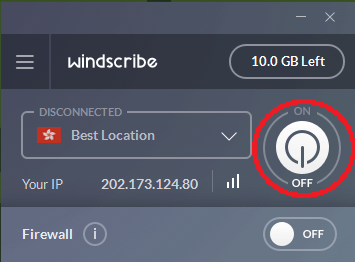 The best thing about Windscribe is that it provides a free service for lite users along with the paid services. If you go with creating an account without entering an email ID or entering an email ID and not verifying it, you are given 2GB of free usage and if you verify your email ID you are given 10 GB of usage. Also with the free account, you are confined to 1 connection and can choose from 8 locations for the VPN. Double click on the application’s icon or launch it from somewhere in the computer. Click on the power button, the application as per your selected location will connect to the VPN. Once it’s connected it will display a new IP and you are ready to use the VPN. 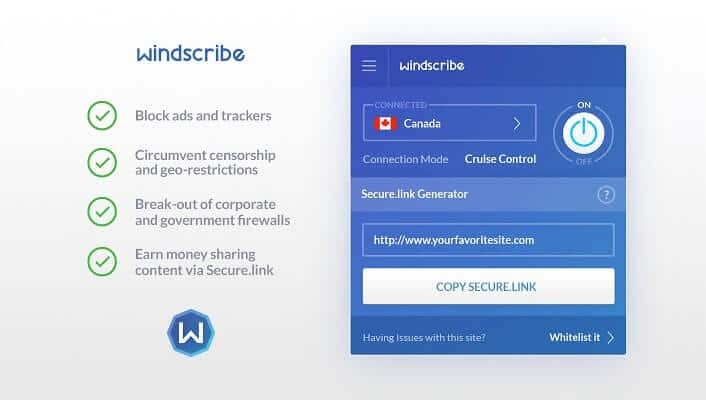 In simple words, Windscribe is a combination VPN and browser-based privacy suite which helps you in protecting all of your communications from prying eyes. Since there are no strings attached with their free plan, you can try their service for some days and upgrade to premium (unlimited bandwidth with more location to choose from) if you like their level of service.